Cotton is the traditional choice for a 2nd Wedding Anniversary. 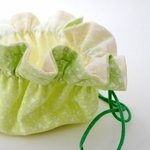 We've designed this cotton pouch especially for a 2nd anniversary gift. Our original cotton, draw string pouch is reversible... The subtly patterned print is shown, with a delicate pattern within. 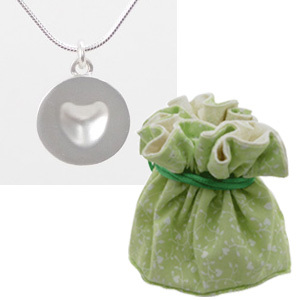 Open this lovely pouch to reveal a unique silver, Melting Heart Necklace. This unique heart design comes with a satin finish in a green pouch, or a high polish finish in a blue pouch. The gift set includes a sterling silver pendant (5/8" dia) with an 18" silver chain.